St. Lucia is an increasingly popular cruise destination. Located in the Windward Islands in the southeast Caribbean between Martinique and St. Vincent, St. Lucia is not as tourist-developed as some of the islands further north. However, it is not undeveloped either. It has attractions and a tourist infrastructure. At the same time, it has great natural beauty. Now an independent nation, St. Lucia is part of the British Commonwealth. Queen Elizabeth II is the head of state. She is represented on the island by a governor general who is appointed from the island's population. The real executive power, however, lies with the prime minister who is the head of the party with the most members in the House of Assembly, one of two houses in St. Lucia's elected-parliament. Despite its ties to Britain, St. Lucia retains a strong French influence. Its legal system is a mixture of the British common law system and the French civil law. Many places have French names and French words mix into the local dialect. This is because for most of its recorded history, St. Lucia was a French colony. The British and French fought over the island for centuries with control shifting to the French seven times and to the British seven times. France finally lost St Lucia during the Napoleonic Wars. Speaking of Napoleon, locals claim that Josephine de Beauharnais, who became Napoleon's first wife and who was the great love of his life, was born in St. Lucia. Her family owned a sugar plantation on the island. However, most biographies list her birthplace as the neighboring island of Martinique where the family also had a residence. The economy of St. Lucia is no longer dependent on sugar cane. Tourism is the main industry. In addition to cruise visitors, there are several luxury resorts on the island. Downturns in the North American economy and resulting declines in tourism have a significant impact on the economy of St. Lucia. 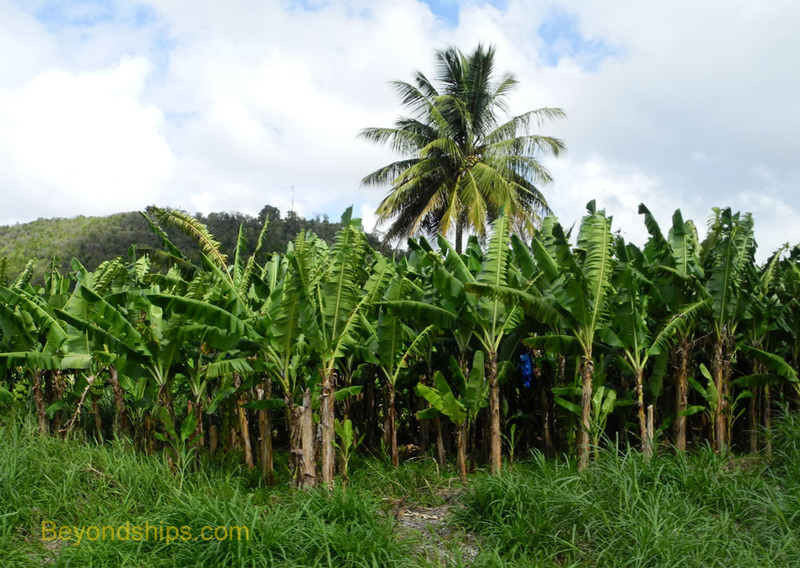 In addition to tourism, St. Lucia derives revenue from exporting bananas, storing petroleum, and from off-shore banking. While some communities are prosperous, other areas are still relatively poor. St. Lucia is a volcanic island and is quite mountainous. The roads twist around and go up and down the slopes. As a result, traveling overland to places that are only a few miles apart as the crow flies can take much longer than you would think. A better alternative can be to take a water taxi along the coast. 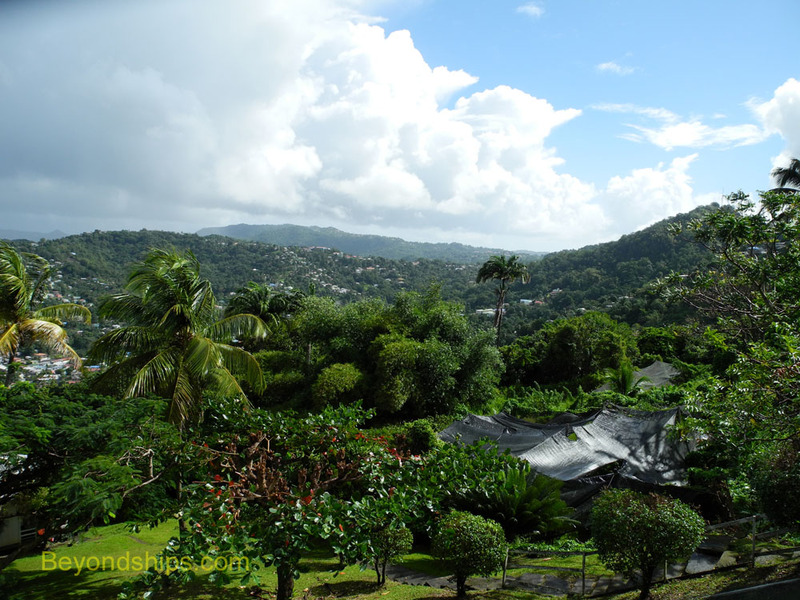 Much of St. Lucia is covered by rain forest. The vegetation is quite lush and makes for some stunning vistas. However, keep in mind there is a reason that they call it a rain forest. ﻿Above: The Governor General's house overlooking St. Lucia's capital Castries. Above and below: St. Lucia has a unique tropical beauty. Above: The Cathedral of the Immaculate Conception. Below: The open-air market in Castries. Below right: Derek Walcott Square. The vast majority of cruise ships calling in St. Lucia dock at Castries, the capital and urban center of St. Lucia. About a third of the island's population live in the Castries area. It has some low-rise modern office buildings but most of the town is made up of older buildings from the 20th century. Devastating fires over the years destroyed most of the town's historic buildings. Downtown Castries is relatively small and walkable. It is not particularly tourist-oriented in comparison to say Philipsburg on St. Maarten or Charlotte Amolie on St. Thomas. The majority of the tourist shops are at the cruise ports Pointe Seraphine and La Place Carenage. A highlight of the downtown area is the open air public market (Castries Central Market) where locals come to sell crafts and food stuffs. The Cathedral of the Immaculate Conception (18987) is said to be the largest cathedral in the Caribbean.. It is by Derek Walcott Square, a park named after Noble laureate Derek Walcott, who was from St. Lucia. 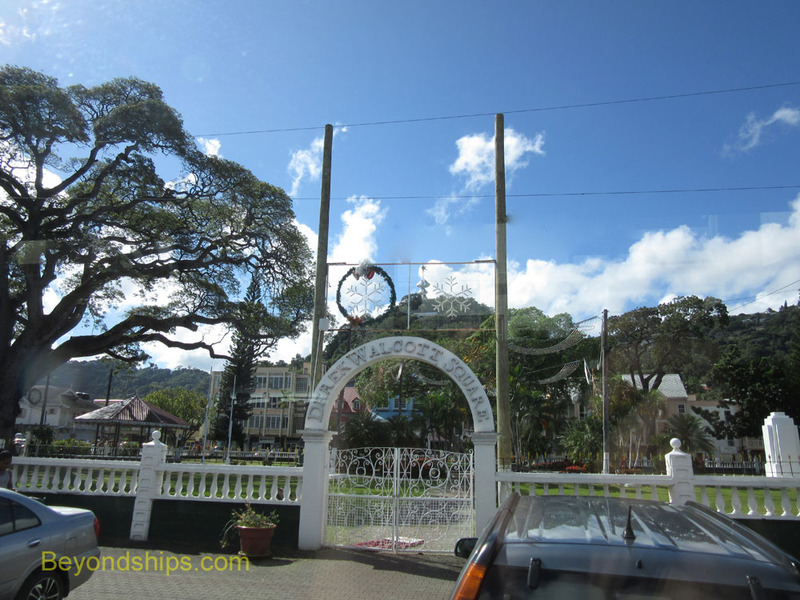 Overlooking Castries is a towering hill Morne Fortune. 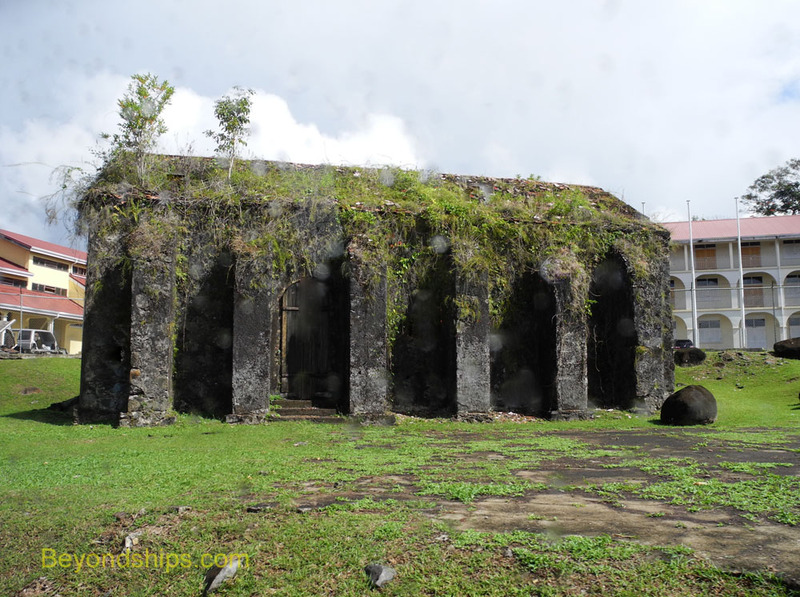 On its slopes are some mansions built by prosperous merchants and some remnants of colonial era forts. There are also great views of the city. However, you will probably need a taxi to take you there. 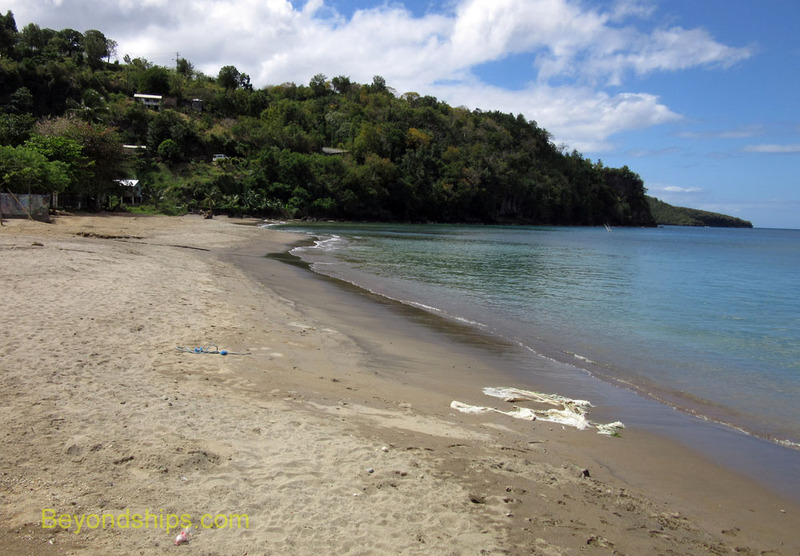 The real attractions of St. Lucia lie beyond Castries. St. Lucia's most famous landmark is the Pitons. These are two almost vertical lava domes that rise thousands of feet out of the sea on the southwest coast of the island. Although spectacular from the landward side, they are best viewed from the sea. Near the Pitons is St. Lucia's semi-active volcano. (See separate article). 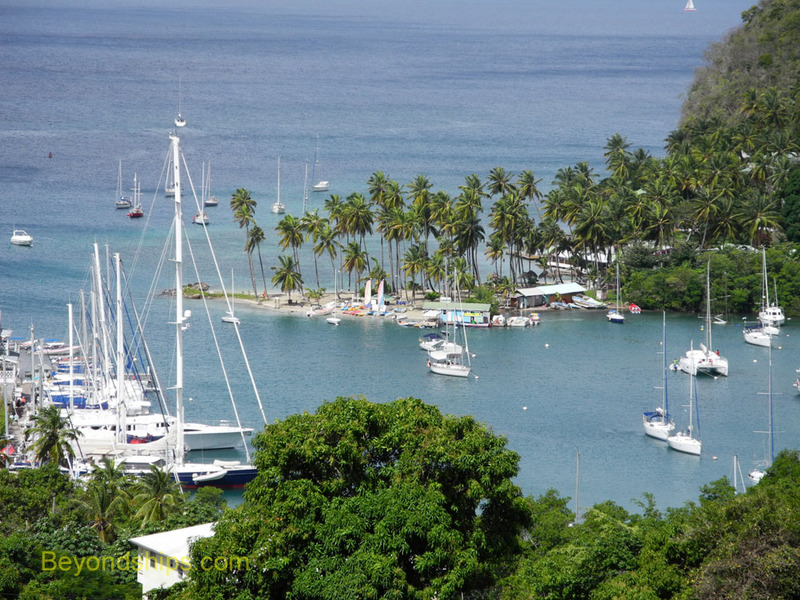 Marigot Bay is one of the resort areas that are sprinkled along the island's coast. Much of St. Lucia is being preserved in its natural state. Pigeon Island is a nature reserve. More generally, parts of the rain forest are open for outdoor activities including zip-lining and exploration by hiking and all-terrain vehicles.